So apparently, wordpress limits the number of images included in a post now; swell. This wooded plot of land at Thurston and Highland is slated to become another apartment complex, this one housing 36 units. First covered in one of my very first entries, and then again when Warren Real estate earned the (in my opinion, unenviable) task of selling it. A former Sigma Alpha Mu fraternity house, the building was more recently home to Phi Delt’s annex and Theta Xi’s failed colony. The structure has been renovated and appears to be a large apartment house at this point. Not too shabby. Collegetown Terrace. Perhaps the biggest visual change from the street was the stripping down of the historic Williams House, which is being renovated to its original dimensions and revitalized as part of the project. Further in, the foundation and parking garage facilities are being laid for the larger, more adventurous apartment buildings of Phase II. This section will be completed by next August, with phase III, with more shiny and overly modern apartments, completed the following year. It has occurred to me that when I hop between construction sites, I could possibly be construed as the worst driver on the planet, because I look to get as close as possible, parking or drive-by, without a whole lot of attention to anything around me. So it hardly seems appropriate that my first police ticket ever was last night, driving home through a town I’ve never been in before in my life, where the detour sign for the bridge I needed to cross was knocked askew, and I tried to make my way back to the state highway. According to the police officer, I went through a stop sign, and upon driving back to take photos this morning, I still have no idea which intersection he’s referring to on the ticket (it only gives one street). This will be a weird day in traffic court. Bad luck, or karma. I suppose it’s one of the two. Anyway, the below photos were taken the day after Thanksgiving, driving back down 81 heading downstate. Since Ithaca’s only a 25 mile detour each way, carpe diem. Checking out Lansing first (as it’s closest to where I get off from 81 southbound), I didn’t notice much in the way of large-scale construction as expected for the new senior homes next to the BJ’s. Although, a utility building did appear to be under construction, seen here on the left side of the image. Update 1/10/13: Only now do I find out this is a new fire station under construction. Not too far away, the woody lot behind the Triphammer Mall is slated to be home to a 3/4 story apartment building. Over at Cornell, the mostly-subterranean addition to the Law School is well underway. This is but the first phase, with a completion likely in late 2013/early 2014. The steel frame of Gates Hall is mostly complete, wish some interior framing underway. The new computer science building, with 101,000 sq ft, will be completed late next year. The green roof is being laid for the new classroom attached to Fernow Hall. 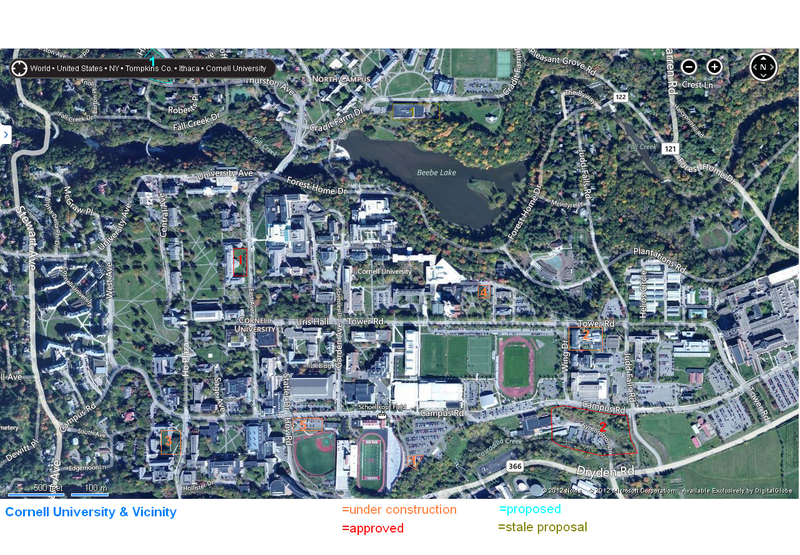 Renovations on Fernow and Rice continue through 2015. The new Stocking Hall/food science addition once again wins the award for “hardest tarp to see through”, a thick black burlap secured fastened to the construction fence. This is why photo number two had to be taken by sliding the camera lens underneath the metal mesh. The new building will be completed roughly next summer, with renovations of the older parts of the Stocking Hall complex to continue into 2014. The new building for the Big Red Band appears to be undergoing foundation work, and working were on site when I visited. Being a small, 4,700 sq ft structure, the completion date just a few months away seems fairly appropriate. Heading into Collegetown, the Belle Sherman Cottages project has advanced a little further, with a second home complete and a third well under construction (workers were pouring the base for the garage as I walked by). I checked the other lots for “sold” signs, and although some of the land appeared to be disturbed enough for additional foundation work, I did not notice any more sold lots, so this home may be the last built in the near-term. The new townhomes at 107 Cook Street are undergoing the last of their exterior work, and will probably be complete by the end of the winter. The two townhomes offer 12 bedrooms total, one less than the destroyed apartment home they replaced. This seems like bad planning. The concrete bunker of a building still stands solemnly, awaiting news on whether the new Collegetown Crossing building will be on site. Ithaca Gun. Still empty since construction/remediation stopped in August due to cost overruns, and seemingly as polluted as ever. At this point, you’ll have to tear out a section of the Earth’s crust to get rid of all the pollution. 1. The Big Red Marching Band – A 4,400 sq ft practice facility for the marching band is well underway, with completion set for mid-winter 2013. 2. Stocking Hall Renovation/Addition – Structural work is roughly complete on the 136,000 sq ft, 4-story addition, with renovation of the neighboring old Stocking Hall underway. The new portion will be mostly complete by next summer, with rehab work in the 1921 building due for completion the following year. 3. The Law School Addition – Phase I is underway, with a completion expected in winter 2013/2014. The project adds 16,500 sq ft (mostly underground) to the Law School complex. 4. Fernow/Rice Halls Renovation/Addition – Renovations, and the small partially underground addition with a green roof, are underway. Fernow will completion renovation next year, and Rice Hall in 2015. 5. Gates Hall – Probably the most obvious project on campus, the new William Gates computer science building has topped out, with interior and exterior framing underway. Completion of the 101,000 sq ft building should occur in late 2013. 1. The New Humanities Building – The 66,500 sq ft addition/boring glass box next to Goldwin Smith will go out for bidding in mid-2013, with construction likely to begin around winter 2013/2014, and a 2015 completion. 2. The CU ERL Project – Approved, but contingent on funding approvals from the feds. I believe this one isn’t expected to start until 2013, with a five-year time frame for completion (i.e. don’t hold your breath for this one’s ground-breaking). The synchrotron will be expanded, as will the Wilson Lab, for a gain of about 185,000 sq ft.
1. Not Cornell, but pertinent – a four story, 36 unit (88 bed) project for the corner of Thurston Ave. and Highland Ave.
1. The proposal to renovate and complete a $15 million addition to Helen Newman Hall on North Campus has stalled out for the short term, probably because lab space and academic space outcompetes leisure/activity space. It’s a university, after all. 2. Ithaca Gun, with about 45 units proposed. Remediation after remediation after remediation, and I think most people still believe the land is toxic. Construction is on hold until the land is considered clean enough for reuse. 1. The Belle Sherman Cottages – 19 homes and 10 townhouse units, built as the market demands. In the past several months, two homes have been completed, and a third is well underway. 2. Collegetown Terrace – The massive project that ate half of State Street. Phase II is currently underway, with a completion set for next year. When all three phases are complete in 2014, the complex will have added over 650 beds to the Collegetown market (~1,250 gross), in 12 buildings ranging from 3-6 floors. 3. 107 Cook – The rebuild for the deadly fire that destroyed the previous 107 Cook in April 2011. 12 bedrooms, near completion. 1. 67 townhomes proposed in an area just off 79. The housing will be geared towards Cornell employees. Not off the ground yet, but I would expect approvals sometime in 2013. 2. Collegetown Crossing – A six story, 103-bed project (with ten more beds in a house on Linden that will be renovated as part of the project). The ground floor will house a pedestrian walk, a bus stop and commercial space, including a branch of Greenstar Co-Op. 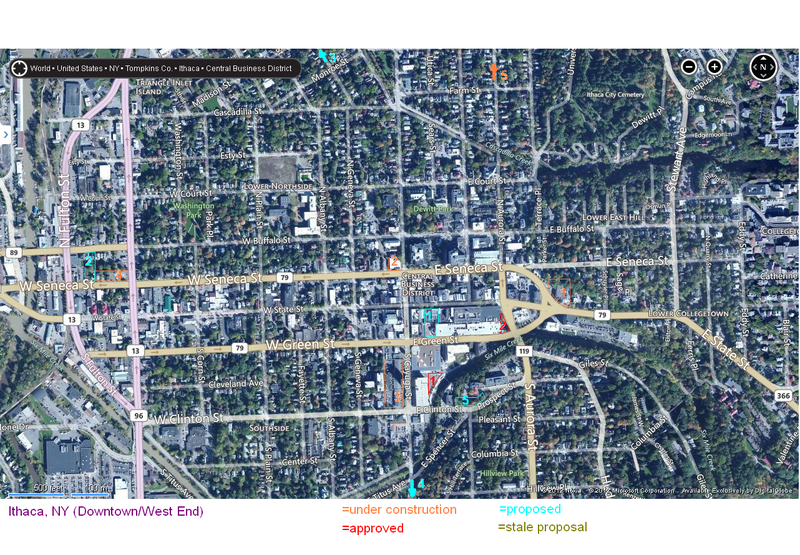 The project has gained some notoriety for seeking a huge parking variance, which has aroused the ire of some of its neighbors; a highly-criticized parking study had been conducted. It does appear the project is close to approval, and if that happens, I’d expect construction to start around late Spring 2013, with an 18 month time frame. It’s been about a year and half since the first set of maps. For one thing, I felt that for the work that went in, I was unsatisfied with the result, which kept me from attempting a revision for a while. But, at this time, it would be high time to post a long-overdue update in map form. 1. Seneca Way – Which just held its official groundbreaking. 5 to 6 stories (it’s on a hill), 38 apartments and some office space, which will be rented by Warren Real Estate and the Park Foundation. Readers might recall that the Park Foundation, an NPO, floated the idea of renting space in the Cayuga Place project. 2. Breckinridge Place Apartments – a 50-unit, six-story project undertaken by INHS, the affordable housing group. The project is set for the first renters to move in in fall 2013. 3. The Holiday Inn Expansion – The low-rise two-story wings of the hotel are being demolished to make way for a 9-story tower with 115 hotel rooms. Now, I think offhand that I could count the gross increase in rooms on my fingers and toes, but the real important piece of this project is a small convention facility, sorely needed in Ithaca. 4. Iacovelli Apts., 619 W. Seneca – These should be in the final stages at this point. 3-stories, 24 units. 5. Aurora Street Dwelling Circle – An eco-friendly pocket neighborhood with 4 new units. Construction began in July. 1. Cayuga Green – After an extension on special financial abatements with the city, this project has been virtually mandated to start construction by mid-2013, and I do believe the developer has obtained financing. The new building will offer 39 units and a small amount of commercial space. 2. Ithaca Marriott Hotel Downtown – Originally conceived as the Hotel Ithaca, the project underwent a significant revision, which require (and recently received) approvals. The project has 160 rooms, 10-stories, and is set to start construction no later than March on an 18-month time frame. 1. Harold Square – A recently-proposed and massive project by Ithaca standards. 11 floors, with 126,000 sq ft of office space and 60-70 apartments. The project will likely be through several months of scrutiny before receiving approvals, with completion probably in the 2014/15 range. 2. Planned Parenthood, Ithaca – Undergoing review, the project seeks to build a new two-story building with 18,200 sq ft of space. EDIT: This one was just approved at the last meeting. But it would be a pain to update the map. 3. Cascadilla Landing – Another massive project. I believe preliminary, but not final, approvals have been granted. The project seeks to beef up Ithaca’s waterfront substantially with 22 townhomes, 134 apartments, and about 36,000 sq ft of commercial space. 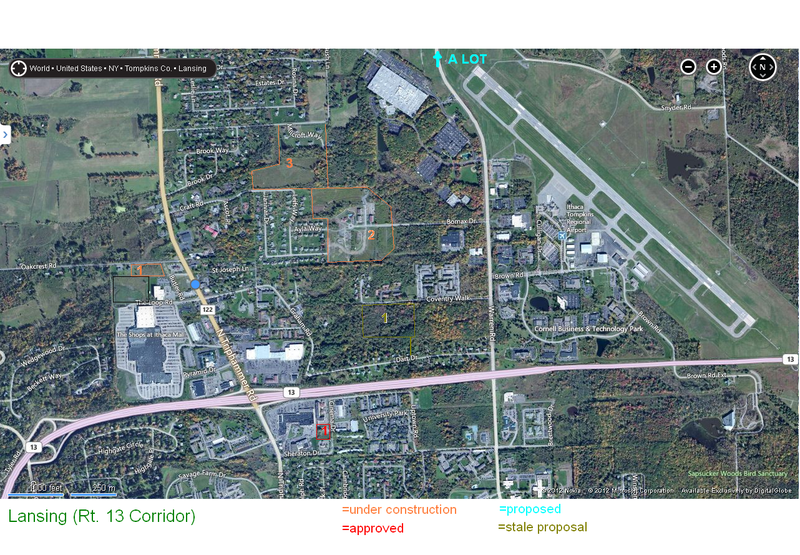 Construction is expected shortly after approval, and will take place in phases over two years. 4. Stone Quarry Apartments – INHS’s newest large scale project, with 35 units, 19 in a three-story apartment building and 16 townhomes. The project is slated for 400 Spencer Street, a site currently utilized by Ithaca Taxi Dispatch. The project has just started preliminary review, and financing is being arranged. Surprise, surprise, neighbors say they oppose the project, with traffic concerns, and one woman claiming “it would attract criminal activity to the area“. Apparently, a 24/7 taxi operation is much more preferable. 5. Yes, I am lazy enough that I have yet to write an entry on this. It’s in the queue. Three apartment buildings, three stories each and with 36 units total, proposed for the hilly 100 block of East Clinton, or just east of the police headquarters. 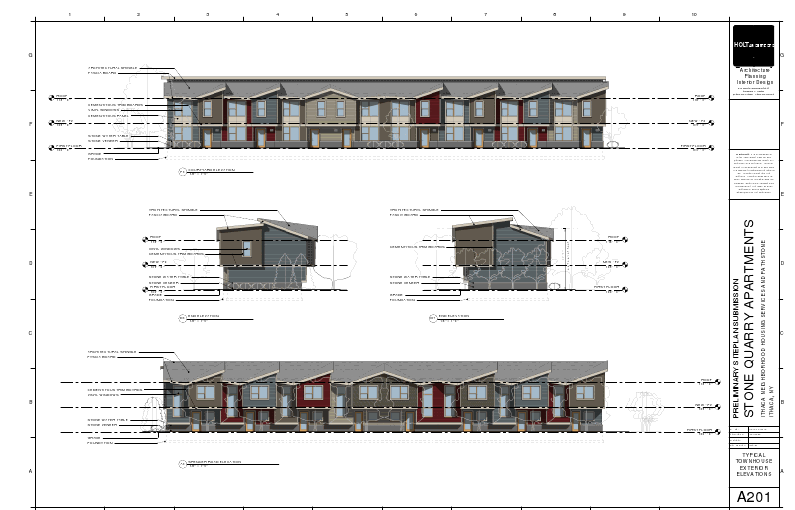 The building will have wood siding, shingle roofing, and will likely look vaguely similar to the large apartment houses similar to those in Collegetown. 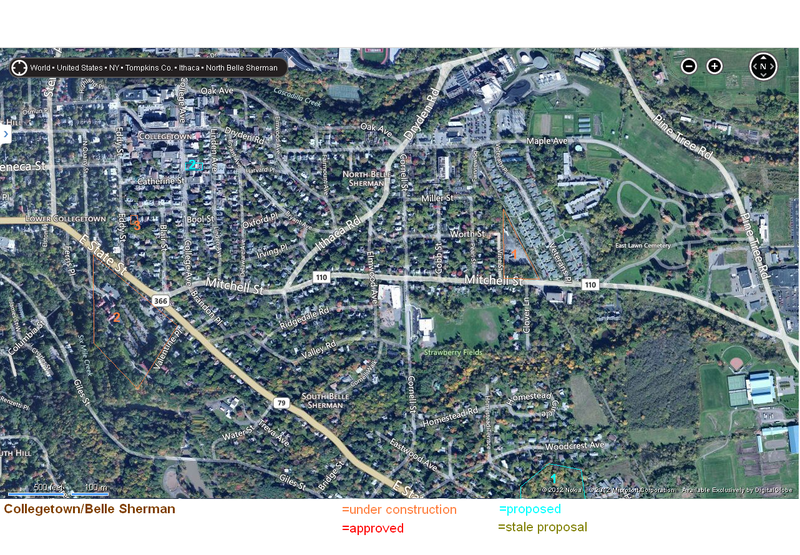 The project is by Ithaca’s favorite all-for-one stereotypical capitalist land developer, Jason Fane, who owns the Cityview complex on the north side of the property. Cityview’s lot would share parking with the new buildings. Turning to suburbia, as C’Town and Cornell will be a later entry, there’s a few things going on. 1. 12 senior apartments, a byproduct of the approval process for the new BJ’s (black box). 2 and 3. Housing developments – Millcroft (31 lots with about one-third sold/built), and the Heights of Lansing (80 units, about 25% complete). 1. 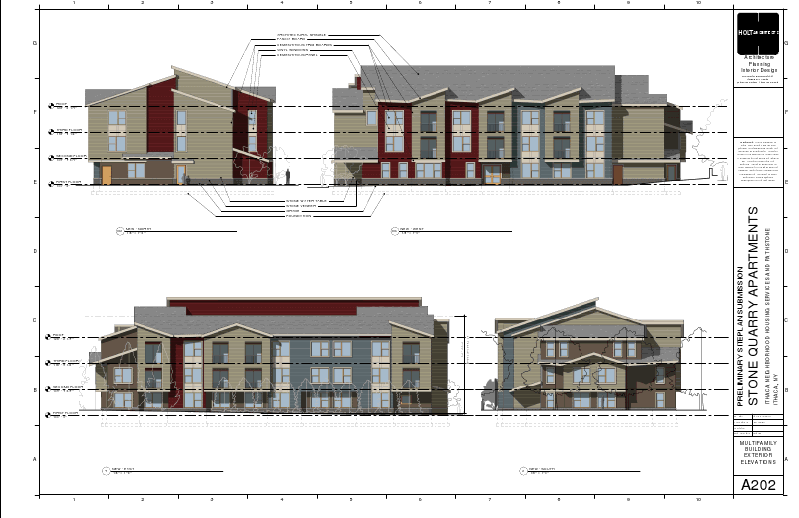 Off of Cinema Drive, a 39-unit, 3/4 story apartment building with two retail spaces. For 65 units of housing. Let’s do some math. If there’s one car per residence, that’s 23 car trips a day minimum. Hm. Seems a little high. Regardless of the bat-s**t insanity of the nimbys, the project is on hold while land-use studies are undertaken. But hey, this is the village. Right up Warren Road about a mile or so, the town is considering an 88-unit project, and an apartment project that would add 312 units to two complexes in that same area. The 312 apartments have preliminary approval, so it won’t be long now. And let’s not forget the town’s Town Center projects. So by all means, complain about the undesirables. It’s bittersweet. After 26 years of operation and over 20,000 responses, Dear Uncle Ezra, the “Dear Abby” of the Big Red, has gone on indefinite sabbatical. DUE was useful to this blog for its grab-bag of historical info, cited in these entries many times over the past few years. When first launched in the fall of 1986, DUE could be accessed from one of the two dozen computer sites, or few personal computers on campus. Now in 2012, and thinking of blogs like this one and of internet culture, I suppose answers to many writers’ questions are just easier to find through google these days. But sometimes, it’s nice to just have someone hear you out, an impartial ear. I wrote to Dear Uncle Ezra as a freshman. I don’t think the question will surprise most of the readers here. A quick back-story on this, but my first few months at Cornell were a very trying time for me, since it was my first real experience away from home. And I guess that experience carries over somewhat to my current situation, as I moved to a new region for the first job in my post-grad school meteorology career. Having to build a new social network. Learning the ropes of my job. Not the easiest things in the world, when it seems tempting to settle into something else “easier” or closer to “home”. I’ve wanted to be a meteorologist, and I came to Cornell to study for that career. However, over the past year or so, I have had an equal if not greater interest in studying to be a history teacher at another university (it has a more focused program than Cornell’s, though I mean nothing against the school). I know that if I transfer, a lot of people will be dissappointed that I’m throwing away an “Ivy League education”. I feel confused and somewhat frustrated at being unable to make a decision, and I have to make it within the school year*. Could you weigh-in on the issue? Glad to hear that you haven’t waited til the last minute and have the year to think this one through. Choosing a career can be a very difficult process, but remember that it is a process and not just one single decision. Fifty years ago, people in the United States got into the mind set that you chose a career (or even a company) and stayed there until retirement. This is no longer true, as there is a lot of flexibility to combine interests into a “perfect” job, or to change positions or careers along the way as your expertise and needs change. 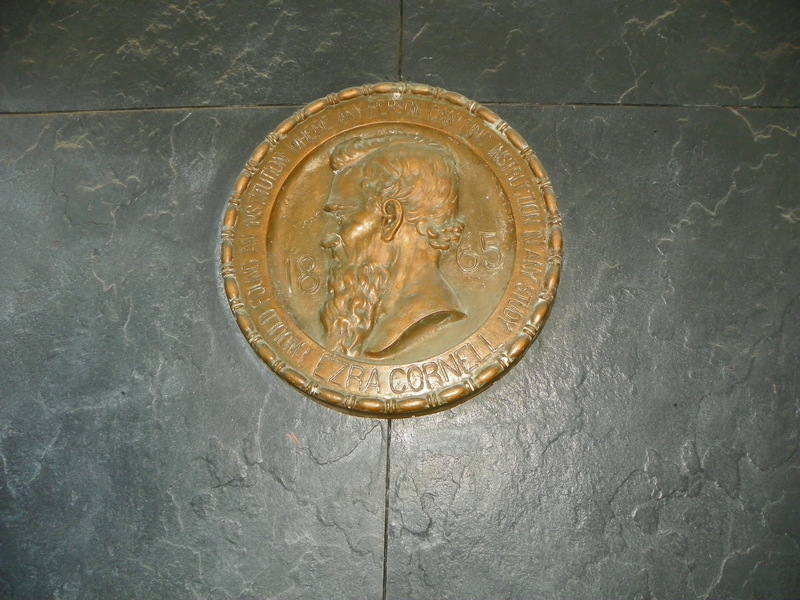 I myself, Ezra Cornell, was a carpenter, potter, farmer, public works engineer, communications entrepreneur, and then founder of this university. But back to you. In order for your direction to be the right one for you, you will need to continue engaging in the process of exploring your options. One way to do that is to do research on what the two careers will be like. Interview people in those positions to learn more about them. Make an appointment with Cornell Career Services, 103 Barnes Hall, 5-5221. They provide a wide range of services to help students reach decisions on majors and careers. They could also help you find an internship or lead you through their career- information library, which might lead to greater clarity. It might also help to talk to those people who think it would be a mistake to change schools: hear their thoughts and let them know your needs, goals and dreams. Remember that it is your life and you must make the decision that is right for you after you weigh all of the information that you gather. If you need a great sounding board along the way, feel free to contact EARS for free, confidential and immediate counseling by phone or walk-in, 5-EARS or 211 Willard Straight Hall. So I stayed the path in my career, doing my BS, my MS, and now at my first job (with what may be job number two coming up at a research facility a five hour flight away). My life is in flux, and it’s intimidating. Sometimes its good to have someone to sound off to. And for me personally, that’s what Dear Uncle Ezra was. Finding renderings and digging up information tends to be a one-person task. Once in a while, on a whim, I’ll email the marketers or a director of new projects, or whoever is in charge of something, and ask them if there are any public renderings. As one might expect, I don’t get a response back. Actually, until yesterday. I only check the ithacating email once every few days. I had emailed Scott Reynolds, the Director of Real Estate Development for INHS, asking if I might be able to get a copy of the renderings. My reasoning in my intro email. “I follow Ithaca construction projects, but I’ve moved out of the area for the time being.” Essentially, this makes me some random guy, not a potential client. I received renderings in response to my inquiry. A small piece of my faith in humanity has been restored. The apartments have a fairly modern look, clean and contemporary if perhaps a little fussy with the rooflines. But, this design is much more comforting than certain other recently proposed projects. The townhouses follow the same theme. There will be 16 townhomes (two rows of eight), and 19 apartments in the three-story building. In conclusion: Scott Reynolds, you’re awesome. Thanks.